Denon CEOL Piccolo N4 review | What Hi-Fi? 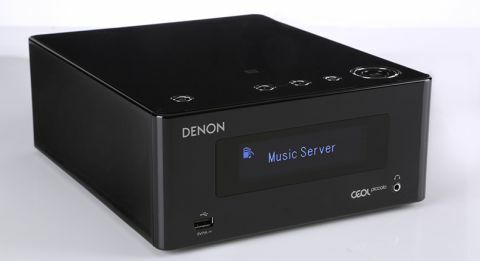 When Denon’s music-streaming, optical-drive-omitting CEOL Piccolo arrived on the music system scene in 2013, it got our performance-per-pound bells ringing loud and clear. Many more systems of its kind have arrived since, but this new-and-improved CEOL Piccolo N4 – cheaper than its predecessor by £60 – remains one of the most affordable on the market. You get a lot of features for the money, making network streaming accessible for tighter budgets. Since then, it has been subject to a smattering of upgrades. Spotify is now better integrated. While the old version had the streaming service built into the box, with users having to enter their login details and search and navigate music via the Piccolo’s remote control, Spotify Connect is now onboard so all control is via the Spotify app on your smartphone or tablet – much more convenient. The new Piccolo does away with its predecessor’s iPod dock, but the Apple-friendly USB input on the front for playback and charging lives on. In terms of connections, RCA and optical inputs allow for an analogue or digital hook up to a TV or, if you really miss the discs, a CD player or transport. There are subwoofer and headphone outputs to the rear too. Hook the Denon up to your home network (there’s wi-fi onboard, but an Ethernet connection will be the most stable route) and you can stream your music collection from a laptop or PC – the Piccolo supports AirPlay and Windows 8 – or a NAS drive. Just make sure everything is on the same network and you can’t go wrong. Thousands of internet radio channels are at your service too so whether you’re a fan of BBC’s Radio 2 or Orlando’s Sunny FM, you can get it in a heartbeat. A network isn’t compulsory to stream music to your heart’s content, though. The Piccolo supports Bluetooth with NFC – simply tap any NFC-compatible device on the unit’s top panel (a NFC badge marks the spot) for instant pairing. Speaking of the top panel, it is now made from a dual layer of acrylic, which comes in either high gloss black or white. The set of buttons on top are new, albeit not too dissimilar, and push terminals replace its predecessor’s banana-plug ones. It also adds ALAC support up to 96kHz to its predecessor’s 24-bit/192kHz WAV and FLAC playback. Impressively armed for a machine of this price, the Piccolo also comes with a shiny new app. Download Denon’s Hi-Fi remote app on your Apple or Android smartphone or tablet, making sure both the unit and device share the same network, and you’ll find that browsing music libraries is far easier than it is using the handheld remote. The no-frills interface is simple to navigate whether you’re queuing songs, building playlists or using the search bar to pin down specific tracks. We had no problems using the iOS version on the latest iPod Touch, although the Android app on a LG G4 froze a handful of times and kicked us out on occasion. A little more stability wouldn’t go amiss here, Denon. The physical remote is next best: pleasingly big, responsive and logically laid out – even if it does take a few minutes to get used to pressing the left navigation button to ‘go back’. Thanks to the unit’s bright and crisp OLED display and good-sized text, you won’t be straining to see artist, track name and duration from the sofa either. A song’s sample rate can also be displayed by pressing the remote’s ‘info’ key. Whether the Piccolo is playing a 24-bit/192kHz song from a NAS or a low-res stream from Spotify, it treats you to a clear, smooth and well-balanced delivery awash with insight and confidence. We kick things off with Them’s Gloria and are instantly struck by how rich, solid and full-bodied Van Morrison’s spoken vocals sound. That saturated midrange doesn’t put expression in jeopardy, though, his growly, gravelly quality coming through no holds barred. The distinct three-chord guitar structure, deep walking bassline and rolling drumbeat are tight, agile and articulate, each note straddling the line between thickness and crispness confidently. Even if the Denon’s dynamics aren’t as far-reaching or subtle as we’d like, the track’s blatant fluctuations are tangible. Cymbals ring out with zing and feeling too, never teetering on hardness. While instruments don’t have acres of space to play in, the presentation doesn’t feel congested either – even the track’s denser sections lathered with manic drum-playing, cymbal bashing and droning organs are coherent. Drop down to a 320kbps Spotify stream of David Gilmour’s Today and the presentation remains squeaky clean, the Denon flaring up enough detail and clarity to keep us interested. The introductory choir sounds suitably big and layered, and the instruments escorting Gilmour’s distinctly soulful vocals know their place in the well-mapped soundscape, leaving the various guitars, drums and keyboards to collaborate without bumping into one another. In our review of the old Piccolo we said, “a little extra attack wouldn’t go amiss if Denon were to produce a Piccolo Mk 2”. It seems Denon didn’t get the message because the Piccolo still seems reluctant to fully exert itself. With CD-quality Prince’s I Wanna Be Your Lover, chords should lurch forward like a passenger on an abruptly halting bus, but they feel a little held back. The bass tab carries more energy than is communicated through the Denon, and we crave more sparkle and kick from the up-tempo melody. While we’d normally suggest the Q Acoustics 3020s speakers as partners, their smooth and rounded manner highlights the Denon’s lack of attack and the partnership’s presentation sounds a bit lifeless. The Dali Zensor 1s are a better fit, doing their best to make up for the Denon’s inherently laid-back character with their lively, harefooted temperament. Straight away, the Prince song sounds more alive and animated, even if we are still left wanting a little in terms of dynamics and drive. Clearly, system matching makes all the difference here. While that’s not too much of a setback for those looking to build a system from scratch, it’s certainly something to consider for those who have already invested. We like the Denon CEOL Piccolo. Even though its lack of attack forces it to rely on fun-sounding speakers to help fill that void, it nails the basics and does enough right to be considered a good introduction to network streaming for those with stricter budgets. If you can stretch the pennies for the significantly more musical and transparent Cambridge Audio Minx Xi streaming system (£400) – last year’s Product of the Year – we would do so. But if you can’t, the Piccolo could be just the thing to open you up to the wide and wonderful world of music streaming.